Contrary to the implication in some obituaries, Max Perutz, who died on February 6 2002 in Cambridge, England, just a few months before his 88th birthday, did not determine the first three-dimensional structure of a protein molecule. John Kendrew did that. Max did determine the structure of the hemoglobin molecule (Figure 1), but Kendrew's low-resolution myoglobin structure predated the 5.5 Ångstrom-resolution hemoglobin structure by more than a year, and when Max published his low-resolution work showing that hemoglobin had the same all-helical fold as myoglobin, Kendrew was publishing his interpretation of myoglobin at 2 Ångstroms resolution, in full atomic detail. Max Perutz (Courtesy of the Medical Research Council, UK). Nor, as many people have assumed, did Max invent the method used to determine those two structures, and thousands that have come after them. The method was invented years earlier for small organic molecules by J. M. Robertson of Glasgow University, in a series of brilliant crystallographic studies. Robertson had even suggested at the time that the so-called isomorphous replacement method might be used to solve the structures of very small proteins like insulin. But no one believed it could work for a protein the size of myoglobin, much less hemoglobin, which is four times larger - no one except Max Perutz. Against the prevailing opinion of nearly every physicist, Max did the experiment. He did it because he had realized that, while the scattering from the thousands of atoms in a protein crystal was weak because the structure was spread out over a large volume, the scattering from a single heavy atom such as mercury, bound to the protein in a specific place, would be strong enough to produce measurable changes in the intensities of the protein X-ray reflections. When Max Perutz showed that these changes not only could be measured reproducibly but also could be interpreted to determine the so-called phases of the protein reflections in the same way Robertson had done, Kendrew was able to use the method to solve myoglobin. It was as much for that pioneering development of the method as it was for the hemoglobin structure that Max Perutz shared the Nobel Prize in Chemistry in 1962 with John Kendrew, who by the way had been Max's first doctoral student many years before. Since then, anyone who has determined a protein structure by X-ray crystallography has followed in Max's footsteps, but his legacy is much larger than that. I don't even intend to mention his founding of the famous Laboratory for Molecular Biology in Cambridge, which has been home to ten Nobel Prize winners since the late 1950s. For me, his greatness - and his relevance to all of us in the age of genomics - rests on two other pillars. 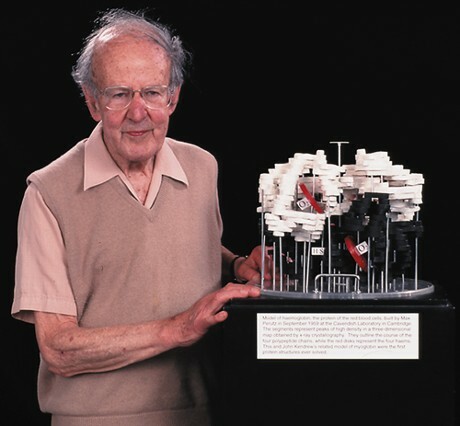 "I wanted to solve an important problem in biology," Max once said when asked what had motivated him to undertake to solve the structure of hemoglobin when most people believed that it was impossible to determine the exact position in space of all of the atoms in anything so large as a protein molecule. He wasn't referring to doing the first protein crystal structure either. The problem Max wanted to solve was a problem in biology, not physics. He wanted to figure out how hemoglobin works. Everything he did, including working out the method to crack the phase problem in protein crystallography, was a means to that end. Max needed to see what hemoglobin looked like because he knew it was impossible to understand how it functions without that information. For him, structure was always in the service of the biological question. Nothing proves that more than the fact that, once the structure was solved, he didn't do what most other crystallographers have done since: go on to the next new protein structure. He kept working on hemoglobin. He kept working on it because that first structure alone didn't answer all of the biological questions. So Max studied mutant hemoglobins with abnormal oxygenation properties from people with genetic diseases, and he worked on hemoglobins from animals with unusual physiology, and he looked that the protein at different pH values and with allosteric regulators bound, and so on, until the very last years of his life. It was only in the past few years that he began work on another problem, that of the structural and functional consequences of repeating sequences such as those found in the protein involved in Huntington's disease. He had just sent off a set of papers on this subject before he died, and as always, his structural studies were driven by the underlying biological problem. In an era when data-gathering for its own sake is much in vogue, including the gathering of reams of protein structure data, Max's scientific life reminds us that the best science is usually driven by a passion to find the answer to a fundamental and important question. The other great thing Max did was to embark, in his 70s, on a second career: as a writer of popular essays on science and scientists. Over the past two decades he penned numerous articles in places like The New Yorker and The New York Review of Books and the Times Literary Supplement. Some of the best of the early ones have been collected in the book Is Science Necessary? : Essays on Science and Scientists, published in 1991 by Oxford University Press. Not a sparingly elegant stylist - he never met a polysyllabic word he didn't like, and his sentence structure tended towards the convoluted - his writing nonetheless passes the supreme test of being not only readable but rereadable. Not bad for someone who, like Conrad, was not a native-born English speaker. My favorite of Max's pieces is Enemy Alien, a delightful account of his internment in Canada in the early months of World War II (because of his Austrian origin), followed by his service in a bizarre undertaking to build giant warships out of icebergs. In these writings he not only defends, brilliantly, the importance of science and scientists, he also puts a human face on what we do, and explains it so that the lay public can be both enlightened and entertained. The great Soviet neuropsychologist A.R. Luria believed that scientists are obliged to produce two kinds of writings: the dry technical reports of their work, and stories told for everyone to understand. He did both wonderfully (if you don't know his work, I recommend The Man With a Shattered World (New York: Basic Books; 1972), his moving account of a soldier with a terrible brain wound), and established a tradition that has been carried on magnificently by Oliver Sacks, whose latest book, Uncle Tungsten (New York: Alfred A. Knopf; 2001), is as good as his classic The Man Who Mistook His Wife for a Hat (London: Gerald Duckworth; 1985). It is hard to think of anything more important than helping the public - who after all put us in the laboratory and trust us to work for their ultimate benefit - to develop a sense of familiarity with what we do and an understanding of what it might mean for them. Genomics is rapidly producing all sorts of discoveries that make lay people profoundly - and perhaps justifiably - uneasy. Max showed us that our obligation does not end with our best efforts in the laboratory. We can't all write the way he did, but we can all find ways to reach out to nonscientists with the same affection, clarity, and lack of condescension. Max Perutz had two children who bore his name, but his work and his ideas produced thousands of progeny. No other form of scientific immortality seems to me more worthwhile.